The spirit of Henry Hudson. Henry Hudson Bridge from Independence Ave.
Spuyten Duyvil is tucked into the corner of the Bronx at the Hudson and Harlem Rivers. The hilly, rocky neighborhood has always been loyally Bronx, unlike its neighbor Marble Hill, which is legally part of Manhattan; that neighborhood was displaced by the dredging of Spuyten Duyvil Creek, which straightened it into the northern end of the Harlem River, ultimately orphaning Marble Hill, which was subsequently joined to the mainland by landfill in 1916. Spuyten Duyvil has been known as Speight den Duyvil, Spike & Devil, Spitting Devil, Spilling Devil, Spiten Debill and Spouting Devil, among other spellings. In Dutch, “spuyten duyvil," the mostly-accepted spelling these days, can be pronounced two ways; one pronunciation means "devil's whirlpool" and the other means "spite the devil." 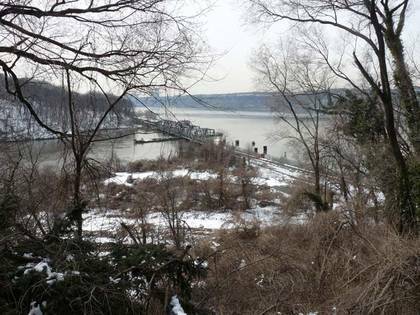 In Washington Irving's Knickerbocker History, a Dutch bugler vows to swim the turbulent waters of (then) Spuyten Duyvil Creek where it meets the Hudson during the British attack on New Amsterdam in the 1660s "en spijt den Duyvil," or in "spite of the devil." The original single-deck steel arch structure was built for the Henry Hudson Parkway Authority by the American Bridge Company at a cost of $4,949,000 and opened to traffic on December 12, 1936. The upper level was opened two years later. 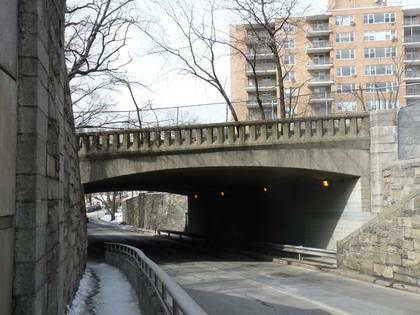 A bridge at this location was proposed as early as 1906, but Spuyten Duyvil residents and other civic groups opposed it, arguing that it would destroy the virgin forest of Inwood Hill Park and bring traffic congestion to the communities on the Bronx side of the river. Meanwhile, traffic czar Robert Moses preferred the route along the Hudson River because he was able to receive the land to build the Henry Hudson Parkway at no cost and use federal labor to construct the parkway. The construction of the bridge helped open the Riverdale neighborhood to development. W. 230th between Riverdale and Netherland Aves. takes the prize as longest step street in the Bronx and probably New York City. Spuyten Duyvilers ascending these steps after leaving the IRT at 230th and Broadway certainly keep their heart rate up when they travel these stairs every day. 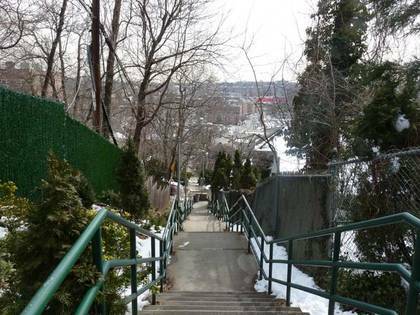 The staircase is four blocks long and connects Riverdale, Johnson, Edgehill and Netherland Aves. Kingsbridge Heights and Spuyuten Duyvil are so hilly that many step streets are necessary so pedestrians can walk in safety. W. 230th is just one of many… there are Godwin and Naples Terraces, Summit Place between Bailey and Heath, at Cannon Place and Orloff Ave. at W. 238th St., and many other western Bronx spots. Some of these step streets preserve one-of-a-kind lamppost shaft designs. 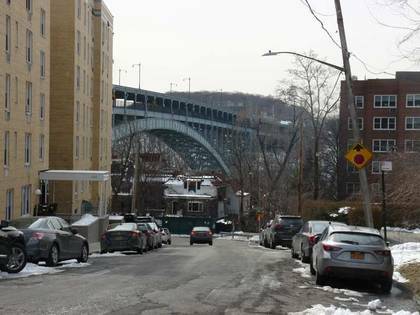 Kappock St. twists and turns in Spuyten Duyvil, dodging hilly areas and ducking under the Henry Hudson Parkway with this picturesque masonry bridge. The Lenape Indians inhabited the land for hundreds of years before Europeans arrived; they called the banks of the creek "shorakapok" or "sitting-down place." After a few hundred years, the name has been pared down and exists as a street name: Kappock (pronounced kay' pock). Half Moon Overlook, on Palisade Ave., overlooks the Harlem-Hudson confluence. It’s named for explorer Henry Hudson's ship. The view isn't the only attraction: the rough terrain below the plaza reveals a ruined house. The view used to be a little better than this, but the trees beneath the parapet need to be trimmed by the Parks Department. The bridge visible from here isn’t the Henry Hudson, which is a bit east of here, but the unnamed swing bridge that takes Metro-North trains across the Harlem River. If you happen upon the overlook at the right time, you can catch the bridge swinging around to admit ships. The AIA Guide to New York describes this NYC Landmark as having "a base of Richardsonian Romanesque, a top of Gothic Revival and a smattering of Tudor details." 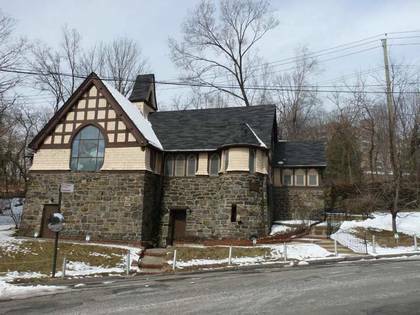 Surprisingly it was designed by Francis Kimball to be a modest chapel for workers of the now-vanished Johnson Iron Foundry. Kimball also designed the brownstone Corbin Building at Broadway and John St., now slated to remain as part of the planned new Fulton Street Transit Hub. Note especially the stained glass windows: they are by Louis Comfort Tiffany. Isaac Gale Johnson was an original Spuyten Duyviler, founding a Civil-War era foundry supplying ordinance to the Union side. By 1890, the Johnson family owned much of what is now Spuyten Duyvil, but by 1938 the factory buildings had been razed. The spirit of Henry Hudson, it seems, seeps through Spuyten Duyvil, though the British navigator and explorer (1570-1611) apparently spent little time here when the Half Moon cruised by the region in 1609. Searching for a passage to the Pacific Ocean, Hudson wrote vividly in his log about the river that would bear his name. Hudson observed the islands that would be home to New York City, and in 1611, did find a northern passage to the Pacific when he sailed to Hudson Bay in Canada, but with disastrous consequences. His crew, Britons and Dutchmen, brawled ferociously and when they found themselves low on supplies on the frozen bay, they mutinied, setting Hudson, his son, and seven loyal crewmen adrift. Hudson presumably froze to death, while the crew starved or were killed in battles with the Inuit. 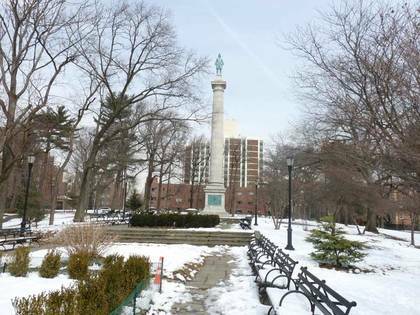 In Henry Hudson Park, at Kappock St. and Independence Ave., you will find Karl Bitter and Karl Gruppe's 1939 memorial, a 16-foot statue of the explorer mounted on a 100-foot shaft (that had been erected 30 years previously, on the 300th anniversary of Hudson's visit here). Hudson and his son are shown bartering with local Native Americans in bronze relief on the base. The Doric column is second only to the Prison Ship Martyr’s Monument in Fort Greene Park as New York City’s biggest.